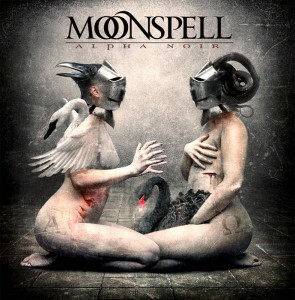 Official Moonspell Facebook: An intricate, marvellous and symbolic creation by Seth Siro Anton, the Greek artist who collaborated with the band on Night Eternal. This may be his finest and darkest piece to the date, invoking all the atmosphere that Moonspell dual album, Alpha Noir/Omega White, will unleashed on April 27th via Napalm Records. Leave your comment or shout your support to the band on our Facebook and Myspace pages. Seth Siro Anton was born in Athens Greece. His love for art was revealed early, at the age of 8, when he started painting his first portraits and landscapes on small wooden surfaces. 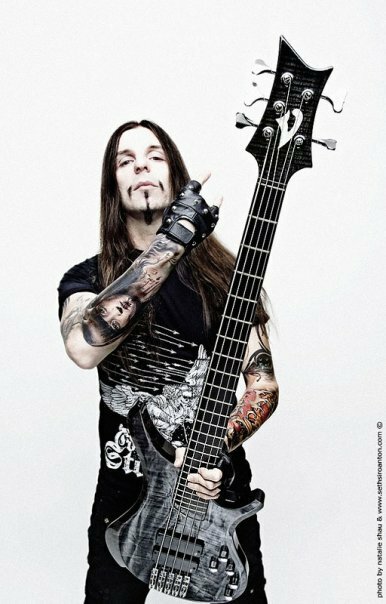 Much later, in 1989, he decided to experiment with music and formed a Metal band called SEPTICFLESH, along with Christos Antoniou and Sotiris Vagenas. Yet the urge to bring his inner visual worlds to the light, was also strong. So, in 1990 he entered a private school on DTP, Digital Design and Graphics. One year later, he started taking private lessons on painting, as a student in the Art Workshop of mr. N. Stefos, developing his skills with the purpose of entering the Supreme University of Fine Arts in Athens. Two years later (1993) he succeeded. He passed the appropriate exams, by gaining one of the top positions among the contestants and was accepted from the Supreme University of Fine Arts in Greece. He decided to initially focus his study in the painting workshop of art, having as a professor the famous Greek painter mr. D. Mytaras. His courses included also photography, scenery and lessons on the perspective of space in art. During the first 3 years in the university, he earned 3 scholarships. Also, his work kept receiving in the final exams of each study period, awards of Excellency by his professors. On the 4th year, he focused more on photography, digital processing through computer software (Photoshop, Painter) and mixed techniques. From 1997 to 2009, he worked as an Art Creative Director in the music magazine METAL HAMMER of Greece. He also pursued a career as an extreme visual artist, by creating the artwork for many albums of well known metal/ rock bands such as PARADISE LOST, KAMELOT, MOONSPEL, SOILWORK, OCEANSIZE, EXODUS, HEAVEN SHALL BURN, CALIBAN, CHAOSTAR, FONY, DEAD CAN DANCE TRIBUTE, JOB FOR A COWBOY,DECAIPTATED,VADER etc. His art gained popularity, receiving extensive coverage in articles from various magazines as Metro(GR), Dark Inspiration (HONG KONG), Urban Mag ( GR) , Project Mag (GR), Rock Hard(FR), Metal hammer( DE), Phot’Art Mag ( FR),Virus Mag ( DE), Inside Mag (DE) and many others . Concerning his career as a musician, he continued working hard with SEPTIC FLESH, recording albums and touring around the world. Up to now, he has done with his band, 6 European tours and 2 in US-Canada tours.